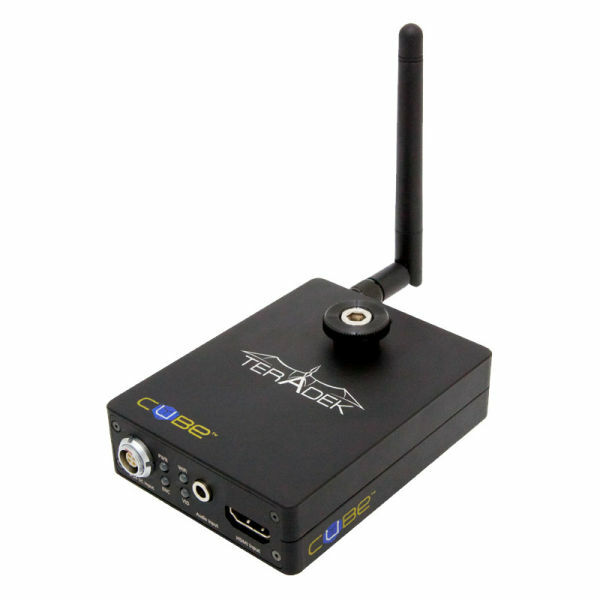 Teradek's Cube Decoder is a small, extremely low-power video decoder that pairs ideally with the Teradek Cube Encoder. Together they provide an end-to-end streaming video solution for filmmaking, news gathering, and ProAV. Cube Decoder features extremely low power consumption and a small form-factor that is ideal for mobile applications, and using a Cube Decoder eliminates the need for using a PC to receive and decode video. Cube's web interface features a Setup Wizard to simplify configuration. After connecting video and powering-up Cube, create a network, logon to Cube's web interface, complete the Setup Wizard, and begin streaming video. Cube is tiny (about the size of a deck of cards), uses only 2.5W of DC power, and weighs only 7 ounces, and mounts easily to a rail system, cage, hotshoe, or camera baseplate. Cube's line-of-sight WiFi range is approximately 300 feet when used with a high quality WiFi access point. Cube has been tested extensively with RED ONE, Arri Alexa, Panavision Genesis, Canon 5Dii, Canon 7D, various handi-cams and more. Cube features a built-in scaler to downscale to lower resolutions.